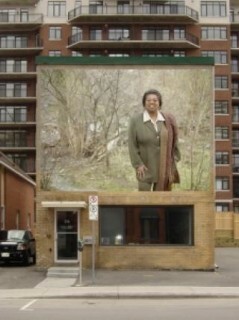 The giant portrait was the work of Althea Thauberger, a Vancouver artist originally from Saskatoon. She is really one of Canada’s finest artists and unfortunately is not seen enough in the national capital, although subscribers to Canadian Art magazine would have noticed last year the cover story on her work among female Canadian soldiers in Afghanistan. This series of photographs showed those soldiers in uniform and fully armed but doing rather unwarlike activities. One shot, for example, showed the women, rifles askew, gaily romping through a field near the Kandahar airport. The photographs were obviously staged. Thauberger required the soldiers’ co-operation. 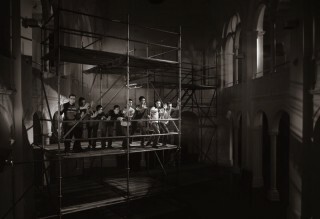 The resulting images were not Thauberger’s first collaborative project with photographic or cinematic subjects. She has done similar collaborative projects with British Columbia tree planters, a group of Italian villagers, and American military spouses in San Diego. I have seen most of these projects. The most striking one is called, in German, Zivildienst: Kunstprojekt, which translates as Social Service: Art Project. This 18-minute black-and-white film is on exhibition at Musée d’art contemporain de Montréal until Feb. 19. It was the best thing I saw on a recent tour of Montreal galleries. It is definitely not to be missed. A still from Zivildienst: Kunstprojekt (Social Service: Art Project) by Althea Thauberger. A bit of background on the project: while Thauberger was an artist in residence at the Künstlerhaus Bethanien in Berlin in 2006, she reached an agreement with the authorities to work with conscientious objectors. These young men were engaged in a form of civilian service instead of doing what was then compulsory military service. The men helped Thauberger write and produce a film exploring the ideas of civilian service, questions of national identity, the power of the state, and the work ethic. The film stars eight young men who act out various scenarios revealing the pluses and minuses of group activities, the power of co-operation and the harm of rivalries. 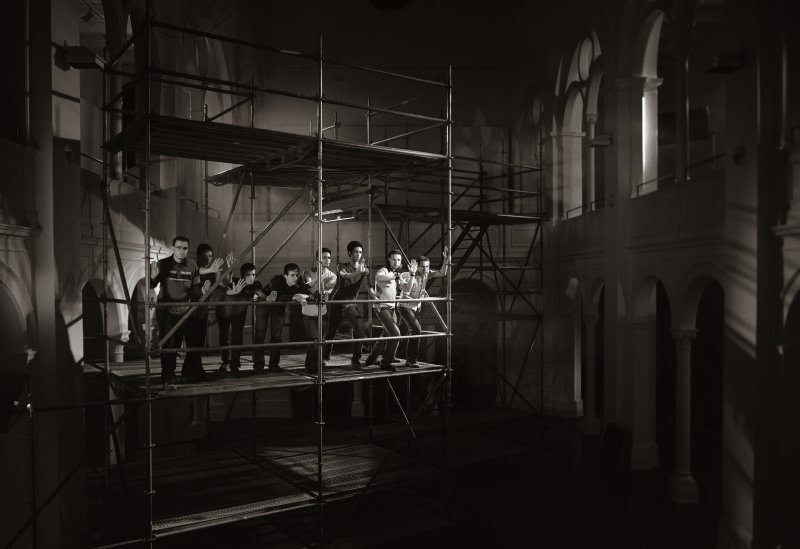 Each little drama lasts only a couple of minutes and is like a visual poem, enacted upon a multi-tiered scaffold. You are constantly aware that the “actors” are amateurs rather than professionals. But that adds a genuine, more human quality that might not have occurred with trained actors. I saw the film with about a dozen people in a large screening room. Judging by the comments overheard afterward, the audience was gobsmacked. So, get to Montreal before Feb. 19 to see this film — or write a letter to the National Gallery of Canada suggesting Thauberger’s masterpiece be brought to Ottawa. As for Jean Augustine, she announced in 2005 that she would be retiring as MP for the Toronto-area riding of Etobicoke-Lakeshore. There were reports at the time she was being shunted aside so that Michael Ignatieff could get what was presumed to be a safe Liberal seat. In the long-run, the voters of that riding, and Canadians generally, might have been better off if Augustine had told Ignatieff to go fly a kite.